The AdCouncil is an industry/corporate financed nonprofit group that creates and places “public service announcements”. I don’t deny that there is a persitent shortage in the blood supply. But isn’t this just a tacit message that it is foolish to think that you can change the fact that big industry is polluting our planet, or even larger, that one person can change the wold? so give up, and just give blood instead? Getting involved in their community through environmental or social activism, mentoring, tutoring, community development. Rather than indulging themselves in gluttenous Americanism? I started poking around on the ad council website only to see that they also have an environmental conservation campaign (not much more than an ad for recycling). 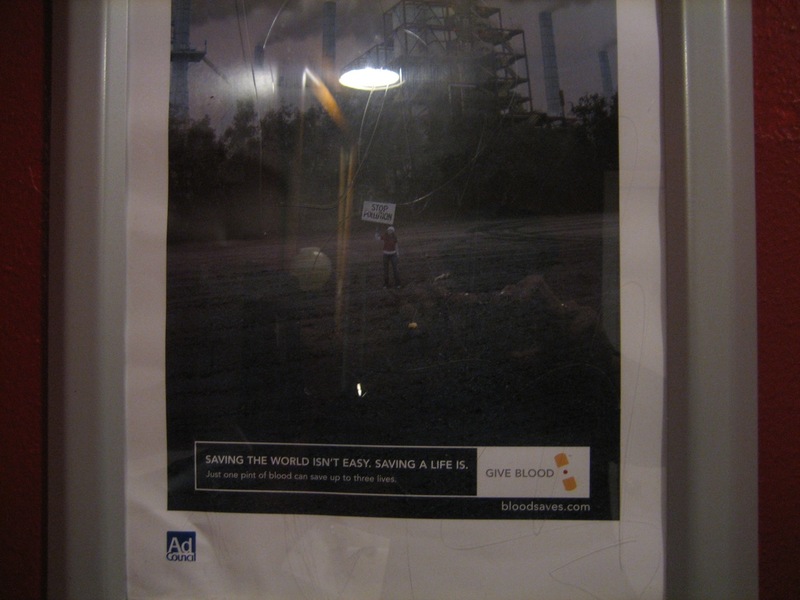 it seems to me that this Blood campaign undermines activism and reinforces the in the minds of disafected young people that they really can’t effect the world. Or am I being too sensitive about this.